Current Page: Home > Tips&Tricks > Video Converter: How to convert MKV to XviD, DivX videos? How to convert MKV to XviD, MKV to DivX videos? MKV is a a file format that can hold an unlimited number of video, audio, picture or subtitle tracks inside a single file developed by Matroska, while DivX was originally based on Open DivX and started after the Open DivX source was closed. To convert MKV to XviD, DivX video format, you can use this mediAvatar Video Converter. mediAvatar Video Converter and mediAvatar MKV Converter both supports MKV format as input and XviD, DivX as output, with both you can easily convert MKV to XviD, MKV to DivX at high speed. The difference between Video Converter and MKV Converter is, video converter can clip & merge MKV videos to XviD or DivX and edit MKV video effects, while MKV converter can not. Below we would like to show you how to convert MKV to XviD, DivX videos with this MKV to XviD converter step by step. After you download, install and start mediAvatar Video Converter, and start converting MKV to XviD/DivX. Drag and drop MKV videos to this MKV to XviD/DivX converter, or click on "Add File(s)" button on the toolbar or "File > Add File(s)..." menu option to load MKV videos you want to convert. 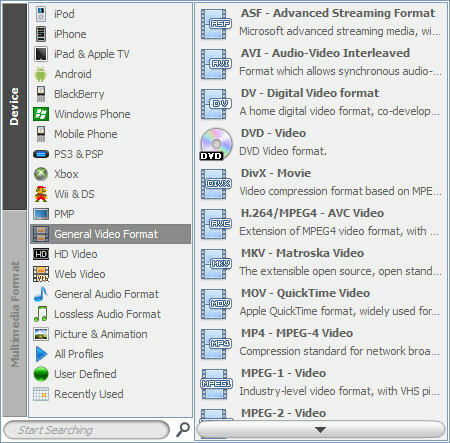 Or click "File > Add Folder" menu option to choose a folder and load all the MKV videos in this folder into this MKV to XviD/DivX converter. Click to open "Profile" drop-down list below the file list, and choose "DivX - Movie" or "XviD - Movie" as the output format from "General Video Format" category. if you want to merge multiple MKV videos to one XviD/DivX video, select these MKV videos in the file list and click "Merge Selected Item(s)" button on the toolbar to merge these MKV videos into an item. If you want to add transitions between these MKV videos, double click the joint item or select the joint item then click "Edit Joint Item" on the toolbar, the "Joint Item" window appears, in which you can check "Enable Transitions" option and select the transition you want from the transition list. For more info about "Merge", refer to Video Converter's detailed product guide. Finished settings and ready to convert MKV to XviD/DivX now? Check all the MKV videos you want to convert, then click "Convert Checked Item(s)" button on the toolbar to start converting these MKV files to XviD/DivX! You'll get the MKV video converted to XviD/DivX in munites. How easy to convert MKV videos to XviD/DivX format with mediAvatar Video Converter! To explore more about this video converter, move on to Video Converter's product tour. Want to have a trial of this MKV to XviD/DivX video converter now? 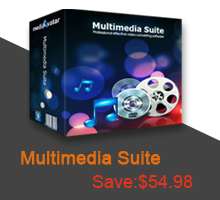 Go to this mediAvatar Video Converter to get a free trial version and explore more! The Matroska Multimedia Container is an open standard free container format, a file format that can hold an unlimited number of video, audio, picture or subtitle tracks inside a single file. It is intended to serve as a universal format for storing common multimedia content, like movies or TV shows. Matroska is similar in concept to other containers like AVI, MP4 or ASF, but is entirely open in specification, with implementations consisting mostly of open source software. Matroska file types are .MKV for video (with subtitles and audio), .MKA for audio-only files and .MKS for subtitles only. XviD is a video codec library following the MPEG-4 standard, specifically MPEG-4 Part 2 Advanced Simple Profile (ASP). It uses ASP features such as b-frames, global and quarter pixel motion compensation, lumi masking, trellis quantization, and H.263, MPEG and custom quantization matrices. There are two DivX codecs; the regular MPEG-4 Part 2 DivX codec and the H.264/MPEG-4 AVC DivX Plus HD codec. It is one of several codecs commonly associated with "ripping", whereby audio and video multimedia are transferred to a hard disk and transcoded.